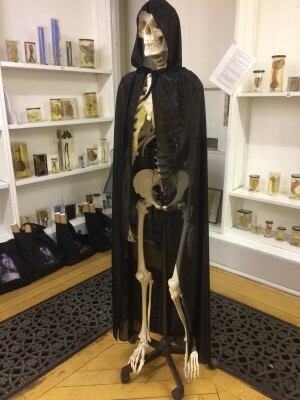 I recently spent a highly amusing evening at the Barts Pathology Museum at the Queen Mary University of London. Oh yeah, I go to all the swankiest places. This was just one of many events of the Vincent Price Legacy London Tour 2015. Jenny, expert in the films of yesteryear, got me embroiled in this one. And so I spent the best part of the day making mini toad in the holes (toads in the hole?). 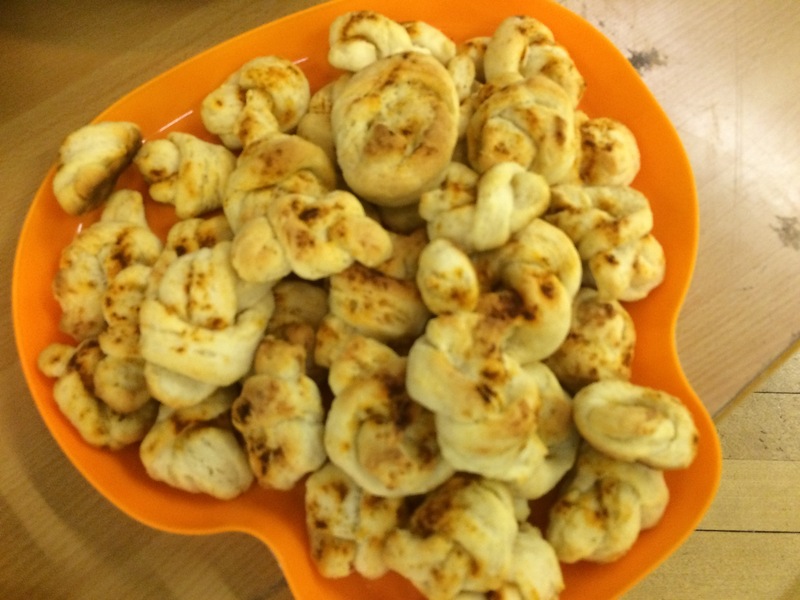 Around 300 of them, in fact – I may possibly never eat a toad in the hole again… Meanwhile Jenny was busy at hers making many, many cheese knots. 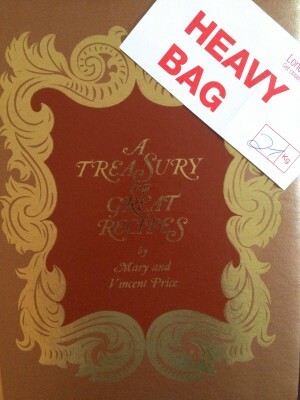 Both recipes are from the fabulous Treasury of Great Recipes by Vincent and Mary Price – the Legacy London tour was all about celebrating the 50th anniversary of this wonderful book. As well as being the Master of Menace, Vincent, together with his wife Mary was a renowned lover of food and gatherer of recipes from great restaurants around the world. I got this book on eBay years ago and I love it: the recipes, the very 1960s photos and the ponderings of the great man about his travels. As you can see – this once tipped my luggage over the weight allowance, but hey, it’s important to take a cook book on holiday. So after many hours of baking the little toads (I didn’t really have enough mini muffin tins, so it was a bit of a logistical challenge to keep my production line going), I was ready – Jenny said she’d collect me in a cab at 3.30 and the last batch were out of the oven at 3.20. I still managed to have a shower and even put a bit of lipstick on. The Barts Pathology Museum was amazing – a library of specimen jars, skeletons, taxidermy and other stuff to suit slightly gruesome tastes. The perfect venue for a screening of Vincent’s Scream and Scream again. 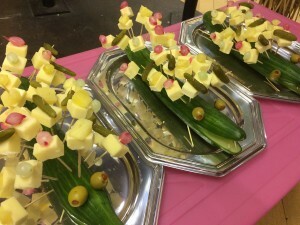 We served the canapés, as the guests milled about oohing and ahing over deformed skulls, tiny foetuses another such delights. My favourite was the cabinet of items that had been extracted from the orifices of several unfortunate or ill-advised patients. It’s incredible what can be fitted inside the human body, even if it does take a medical team to get it out again. I’ve said enough about that I think. I also loved the medical art – beautiful educational pictures that the doctors relied on before photography took over. Carla the curator told us that pics of the specimens weren’t allowed because of human tissue legislation, but I think it was ok to take one of this beauty. The film was followed by a talk from Victoria Price, daughter of Vincent and Mary, who regaled us with tales of what it was like to have Vincent as a father – sounds like it was excellent fun. It was a most entertaining evening in a very cool venue – I have to confess that Jenny and I and the other helpers didn’t fully watch the film as we were mucking about behind the bar, making absolutely sure the Prosecco was up to standard, but I loved hearing Victoria’s stories and the guests were a fun bunch of people, with a shared love of Vincent (not to mention an astonishing level of knowledge about him and his films). The museum is a very cool venue – it isn’t open to the public, but they have suitable creepy events there – check it out if you get a chance. 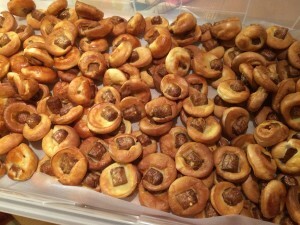 Pigs in a blanket, therefore perhaps toads in the hole.